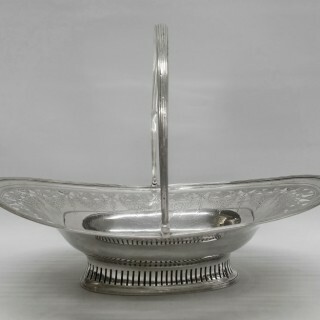 A fine antique sterling silver swing handle basket with pierced silver borders and pretty bright cut decoration. 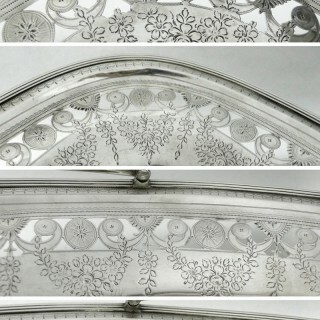 The dainty classical decoration is typical of the workmanship made famous by the Bateman family. Weight 794 grams, 25.5 troy ounces. Length 38 cms. Width 27 cms. Height 11.5 cms, 28 cms (to top of handle). London 1795. By Peter and Ann Bateman. 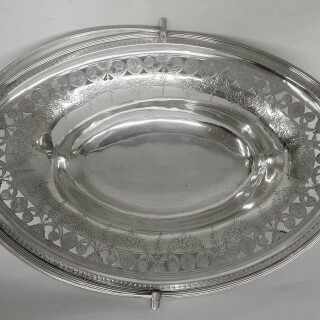 Biography – Hester Bateman (1708–1794) is probably the most well known of all English lady silversmiths and her work is highly collectible. She married in 1732 the goldsmith John Bateman, and together they worked a small silversmith business. 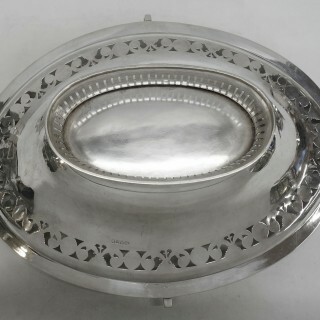 Following the death of her husband in 1760 she successfully ran her family business for thirty years and was succeeded in turn by her sons, grandson and great-grandson and the Bateman family silversmithing company lasted until the middle of the nineteenth century. Hester had at least five children – Jonathan, Peter, probably John (who may have been connected with the business, although he is only recorded as a watch and clock-maker), Letitia (who married Richard Clarke), and Ann. Only Peter, Letitia, and Ann were still living at the time of Hester’s death. Hester registered her mark at Goldsmith’s Hall ‘April 16, 1761, as Hester Bateman in Bunnhill Row and this mark was used until 1790. Hester died in 1794. Her sons PETER BATEMAN and JOHN BATEMAN registered their mark in 1790. This partnership was of short duration as Jonathan, who married Ann Downlinff, died in 1791. In 1791 the mark was changed to PETER and ANN BATEMAN, Jonathan’s widow. In 1800 was registered the mark of PETER BATEMAN, ANN BATEMAN and WILLIAM (I) BATEMAN. William Bateman was the son of Jonathan and Ann Bateman who in 1800 entered in partnership with his uncle Peter and his mother Ann. In 1805, after the retirement of Ann, was registered the new mark of PETER BATEMAN and WILLIAM (I) BATEMAN. From 1815 to 1840 WILLIAM (I) BATEMAN was registered alone. From 1839 to 1843 was registered the mark of WILLIAM (II) BATEMAN (son of William I) & DANIELL BALL. 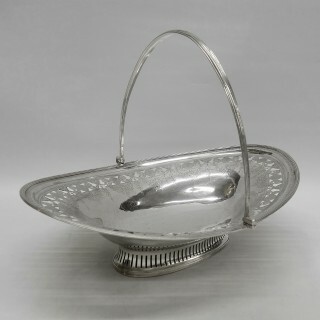 This charming silver basket is in very good condition. The engraving is crisp. 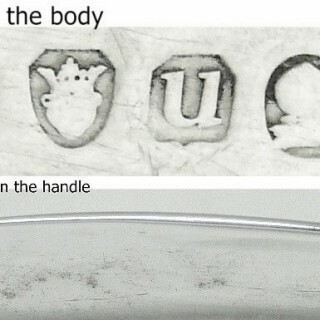 Stamped with a full set of English silver hallmarks to the body and the handle is marked with the lion and maker. The pierced decoration has a very minor solder repair.